Who should be seeing “Red for ED”? Today Arizona is the third state to begin marches, protests and walkouts due to low teacher’s pay and low school funding. I have heard many people on both sides debate this. The teachers are searching for a 20% salary increase and an increase in spending on education. So, the questions that we should ask is who wouldn’t support teachers making more money? Well certainly not Arizona Gov. Doug Ducey who is pushing the Arizona senate to approve his plan to give the teachers their pay raise stretched over 3 years. 9% of which would be paid out the start of the next year plus the 1% that he has already set up as an annual raise for teachers and the remaining 5% to be added in in 2019 and 2020. Despite trying to lower taxes within the state to attract more business to come into the state that would add more money to the bottom line to spend in places like education Gov. Ducey is still greatly in favor of taking care of these teachers yet they still chose to strike. 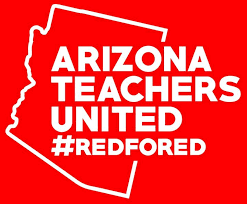 The issue arises with the state Teachers union and a grassroots teacher’s movement called Arizona Educators United says that the 20% spread across 3 years is not enough and they want the amount added on immediately as well as raised spending in education and increased wages for support staff. Though the Governor is in support of the raise some members of the state senate have expressed concern in a direct raise and have put forward to instead give the same money to the districts to spend as the feel it’s necessary. Also not an option that these teachers are interested in. as someone who has done the research around this it feels like a situation of “Eating your cake and having it too.” Of the proverbial child throwing a tantrum because that can’t have something this second. So as parents, citizens and taxpayers we must ask ourselves is have they earned the raises their demanding? Arizona for example is sitting at 45th out of 51(DC being counted in this figure) in median pay while also being 36th out of 51 in overall test scores. By that figure alone yes, the salary wage is earned. But the question then becomes where does the money come from? According to the Arizona state board of education apx. 8000 teachers are currently employed without a teaching certificate between both public and charter schools. Now I know you’re probably thinking “Whoa sir, that is some dangerous area you’re walking into.” But when you look at the numbers, removing those teachers and setting the mandate that only certified teachers can hold these positions it would immediately put 35 k per teacher and would save $279,825,000 that could equate to apx. Another 9% raise per teacher left after the fact. But just by looking at the numbers I’m sure you realize that 11% off the number were looking for. But this would be on top of the 10% being added into the 10% being added at the begging of 2019 which would give them their 20% raise in under 2 years when you add in the continuing raises for 2020. Now some will say it’s not right to let go of 8000 teachers and that it would be too large of a strain on class sizes. But with the school years ending soon this would give time to set up hiring packages for certified and qualified teachers and with that an overall rise in test scores, that will show the national government to put more money towards Arizona for the education system. On a side note for those of you who a have upset by the use of materials within schools that take up quite a bit of each districts budget going digital and initially supplying every student with a tablet and each class with a smart-board would be around $131,000,000 which would allow schools to remove an end upkeep on equipment such as printers, computer labs, space for a library and be very minimal after the initial switch and would save each district Millions in the long run. You let us know how you would do it. Why Don't We Raise the Age to Buy a Gun to 21?